Former YouTube sensation and retro-pop rising star Troye Sivan evades the sophomore curse with his second studio album Bloom, a celebratory and confessional look at Sivan’s powerful self-expression as he details his approaches to relationships as a gay man set to the kind of pop music that inspired him growing up. Working with some of the best writers and producers in the business right now, Sivan’s honest and raw vocal delivery sells the more minimal and understated tracks, while the rest are an energetic yet captivatingly sensual pop extravaganza. We’re immediately transported into the kind of deeply personal lyricism we’re going to get throughout the project on opening track “Seventeen”, in which Sivan reflects – with the slightest hint of regret – on having his first romantic experience through online dating at a young age with an older man. Like most of tracks here, the instrumental isn’t comprised of much more than moody, lush and cinematic synth lines that frame Sivan’s vocals in a kind of ethereal, dreamy way – save for the briefly explosive chorus where some syncopated percussion evokes an earlier era of pop music. Sivan’s descriptions of his relationships here is often viewed through a kind of idealistic sense of wonderment and discovery, and the sound of the music itself reflects this perfectly. Sivan’s similar single “The Good Side” has already landed on my midyear list for 2018, and examines the other side, after a relationship has come to an end, with a similarly ambiguous outlook and minimal instrumental produced by Ariel Rechtshaid. The track is a lengthy slow-burn, Sivan’s vocals at the forefront – and he doesn’t even have to do much to sound great, pouring so much emotion into every syllable. Rechtshaid’s small instrumental embellishments that pop up throughout the track do so much to paint the atmospheric world of the song, Sivan’s lyricism at its best as he details his techniques for moving on from the end of a relationship, thankful for the life he’s able to live as a famous musician, but still reminiscing on the good times and wanting to reconcile things. 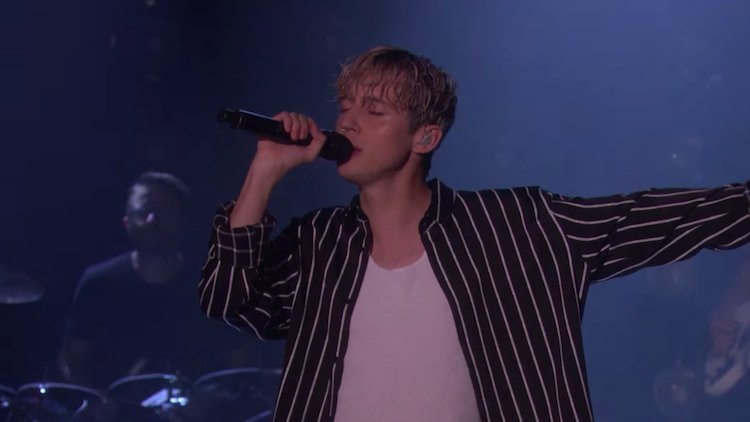 Troye is feeling guilty that he got “the good side” of the breakup. Sivan’s vocals reach their emotional peak on the track “Postcard”, a somber piano ballad where he duets with Australian folk singer Gordi. Sivan vividly describes a specific instance of a failure to respond to a postcard as the first instance of doubting the longterm success of a relationship. Those tiny breaks in his voice at the bottom of his range mean so much to the overall delivery, and the harmonies on the chorus when both singers finally come together are one of the most beautiful moments on the whole project. Sivan gets more upbeat as well, as many heralded opening single “My My My!” at the start of this year. It’s a smartly structured chorus, with a persistent bassline and immediately anthemic delivery from Sivan as his vocals are layered to sound larger than life. One of the real crown jewels of the album, however, is the Ariana Grande duet “Dance To This”. The track took a long time to grow on me, but it really sneaks up on you as one of the catchiest tracks of the year. It’s yet another instance of Sivan embracing a less-is-more mentality, not pushing his vocals on us too much but drawing the listener in with that breathy, almost whispered chorus line. Grande is always a welcome addition to any track, and the two both drop into the sensual part of their range that they’re each known for, complementing each other incredibly well. The bassline is very percussive, and brings that factor of danceability they speak of to what would otherwise exist as a pretty calm and understated track. That repeated synth hook in the background sticks in your head as well – I doubt I’ll ever get tired of listening to this one. “Bloom” is another track that leans fully into the late-80s dancepop sound, featuring some vibrant building synth chords and a syncopated guitar riff as Sivan harmonizes overtop, once again speaking of the excitement of a first love. So much of the strengths of this album comes from the production value, which, like Sivan’s voice, is never overly flashy or too prominent, but fits the mood of the descriptive lyrics perfectly. The driving percussion on the track mirrors the kind of building anticipation that Sivan speaks of. The album loses a bit of steam as it starts to wind down to its conclusion, but there’s still some strength to every track here. Tracks like “Plum” and “Lucky Strike” are slightly redundant in sound at that point of the album, but still possess some pretty flawless dance-pop choruses, while “Animal”, which Sivan describes as an “80s stadium love song”, is a great way to ease listeners out of the project with another slow build Rechtshaid instrumental. Bloom is one of those rare albums for me this year where I can find something to like about every track here, making the selection of a least favourite very difficult. Sivan has a very engaging mic presence, seemingly without even trying too hard to have one, and his lyrics are some of the most compelling of the year while bringing back a great retro sound with an excellent degree of cohesion. Least Favourite Track: My My My!